[HTML1]In this week’s Marine Corps Times, you may have read with disgust the story of a man who lied his way into a circle of trust in Canada by posing as a Marine with PTSD. Behind the story about the unscrupulous faker was the story of the REAL infantryman who became his victim. He is Cpl Chris Dupee, a GRUNT with eight years in the 3rd Royal Canadian Regiment who actually has PTSD. 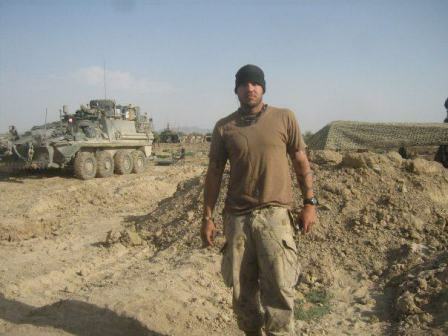 He is a combat vet and is on a mission to help others deal with it, too. His organization is called Military Minds and his Facebook page of the same name is up to almost 5,000 likes — and climbing — after only three months. The video you just watched (above) has gone viral with more than 25,000 hits in two days. The struggling artists who performed the song are in awe of the response. Dupee, who is on duty in Toronto now, started a mobile power washing company as a way of employing soldiers returning from Afghanistan, and when he realized that so many of his buddies needed a place to go where they could talk about their war zone experiences, he started the web site. Canada’s regular force is about 65,000-strong (that includes navy, army and air force). In the more than 10 years since operations began in Afghanistan, 158 Canadians have been killed in action. If there is one thing Dupee has learned from the experience of being stung by one of these dirtballs is that Military Minds is the only organization he fully trusts. He didn’t see this one coming, but he will see the next one… and he’s got some new friends in the Marine Corps who are only more than willing to help. Thank you so much for writing this important story and for helping to spread the awareness! Chris we support you 110 plus, tell us how it felt and keep speaking the truth. PLEASE MAKE A DONATION THING FOR YOUR SONG FREE DOWNLOAD IS FINE BUT LET US SUPPORT YOU WITH A PAYPAL DONATION OF ??? great work, i enjoy reading your posts. my heart goes out to all of you. Heya i am for the primary time here. I found this board and I find It really helpful & it helped me out a lot. I’m hoping to present one thing again and help others like you aided me.